Is there anything as rare and valuable as a diamond? As it turns out, diamonds are not as rare as their marketers would have us believe, and their supposed value is largely based on their supposed rarity a result mostly of the actions of the cartel which practically monopolizes the diamond market. Yet there is no denying the wonder and beauty of diamonds. Diamond Dramas brings the story of some of history's most rare and valuable diamonds to the air. As so often is the case, the story behind the story teller is almost as interesting as the stories themselves. Pioneering Salt Lake City broadcaster Sidney S. Fox's fortune was based on laxative salts. These miracle salts took the form of a beautiful clear crystal that resembled diamonds, thus were branded as Miracle Diamonds. 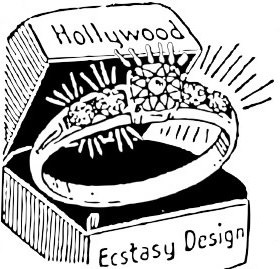 This was the diamond tie-in, which may have been stretching hopes a bit in the Depression Era Mountain Time Zone, but it was enough for the programs creators to feel that the stories could be a good sponsorship opportunity for a jewelery concern. So Diamond Dramas was syndicated and broadcast widely under the sponsorship of Davidson & Licht Jewelry Company and Gruen Watch. The stories themselves are much more fascinating and entertaining than they are given credit for. Diamonds of this much rarity attract the powerful and eccentric, and people of this prominence always make for entertaining stories. They are stories of royalty and wealth, love and treachery, theft and deceit. They are all well done and enjoyably played. Be the first to comment on "Diamond Dramas"